Philadelphia, PA - May 21, 2010 - Philadelphia 76ers President and General Manager Ed Stefanski announced today that Doug Collins has been named head coach of the Philadelphia 76ers. Per team policy, terms of the agreement were not disclosed. "We are excited to hire a head coach with the level of experience, knowledge and passion for the game that Doug Collins has," said Stefanski. "He has been around basketball his entire life, has experienced success at every step throughout his career and we are confident in his ability to lead our team." "Doug Collins is a terrific motivator, teacher, and manager," said Comcast-Spectacor President Peter Luukko. "We believe he is the right coach for the Philadelphia 76ers and the one who will lead us back onto the right track." 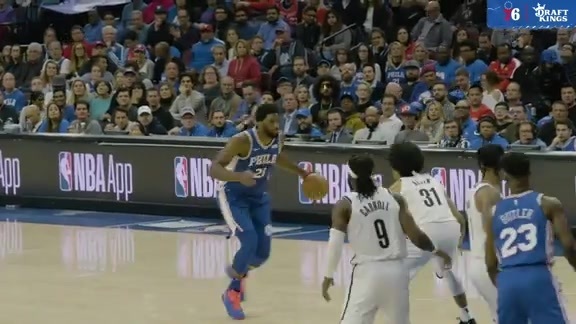 "The past week has provided us with a series of events that we believe will be a turning point for the Philadelphia 76ers," said Comcast-Spectacor Chairman Ed Snider. "Doug Collins is a coach that can make an immediate impact. He has all the attributes that we are looking for in a new head coach and we are happy to welcome him back into the Sixers family." Since his last coaching stint with the Washington Wizards in 2002-03, the 58-year-old Collins has served as an analyst for the NBA on TNT. In eight seasons of coaching, Collins compiled a regular season record of 332-287 (.536) and reached the playoffs five times, highlighted by a trip to the Eastern Conference Finals with Chicago in 1989. By Collins' fourth season with the team in 1976-77, Philadelphia advanced to the NBA Finals. During that postseason, Collins averaged 22.4 points per game, second only on the team to Julius Erving's 27.3 ppg. After injuries forced him to retire during the 1980-81 season, Collins took an assistant coaching job at The University of Pennsylvania under Bob Weinhauer and followed Weinhauer to Arizona State. Collins' NBA coaching career began when he was named head coach of the Chicago Bulls on May 23, 1986. Collins took the Bulls to the playoffs in his first season and guided them to 50 wins in 1987-88, marking the franchise's first 50-win season since 1973-74. In his third and final season with the Bulls in 1988-89, Chicago advanced to the Eastern Conference Finals. In his first season as head coach of the Pistons in 1995-96, Collins inherited a Detroit team that had won 28 games the previous season and engineered an 18-game improvement along with a playoff appearance. Detroit gave up just 92.9 points per game in 1995-96, nearly 13 points fewer than it allowed the season before Collins arrived. Detroit won 54 games the following season (1996-97) with Collins at the helm, which is tied for the fifth-highest win total for a single season in franchise history. In the first three and a half seasons following Collins' departure, the team had a winning percentage of .474. Collins last coaching stint came with Washington during the 2001-02 and 2002-03 seasons where he was reunited with Michael Jordan, who Collins coached during his time with the Bulls. In 2001-02, Collins once again improved his team's win total by 18 games from the previous season. The Wizards posted a winning percentage of .451 in two years under Collins after having a winning percentage of .308 the three seasons prior. The season after he left, Washington won just 25 games. In addition to Jordan, Collins helped with the development of several other future All-Stars who were in the early stages of their careers, including Scottie Pippen, Horace Grant, Grant Hill, Theo Ratliff and Allan Houston, as well as Lindsey Hunter and Richard Hamilton. Collins has been just as successful in broadcasting as he was as a player and coach. He is widely regarded as one of the best analysts in basketball, as evidenced by his induction into the Basketball Hall of Fame's Media Wing in September, 2009. Additionally, he has earned four Emmy® Award nominations and two Cable ACE Awards during his time with NBC and TNT. Collins and his wife, Kathy, have two children. Their son Chris is an associate head coach at Duke University and their daughter Kelly lives in the Philadelphia area. Earlier this week, the Sixers were awarded the second overall pick in the 2010 NBA Draft, which will be held on Thursday, June 24 at The WaMu Theater at Madison Square Garden in New York City, beginning at 7 p.m.
Lower Level Season Tickets for the 2010-11 season are on sale now starting as low as $23 per game exclusively through ComcastTIX at SIXERS.COM or by calling 215-339-7676.